Multiple recent studies have suggested and studied the role of inflammation in progression and development of solid organ tumors. Neutrophil-lymphocyte ratio (NLR) is a biomarker of systemic inflammation which has been shown to be an important marker of recurrence and prognosis in various solid organ tumors, including urinary bladder cancer (Ca UB). UB and determine the predictors of Muscle Invasive bladder cancer (MIBC). Between June 2015 and November 2016, a total of 469 patients were prospectively enrolled into the study out which 434 were included in the final analysis. NLR was calculated as a ratio of neutrophil count and lymphocyte count for all the patients apart from clinical investigations and operative data. The pre-operative investigations and NLR was compared with the operative findings as well as the histopathological features (Tumor stage and grade) of the disease for all the patients. The cut-off value for NLR calculated on the basis of receiver operating characteristic (ROC) curves was 2.52. 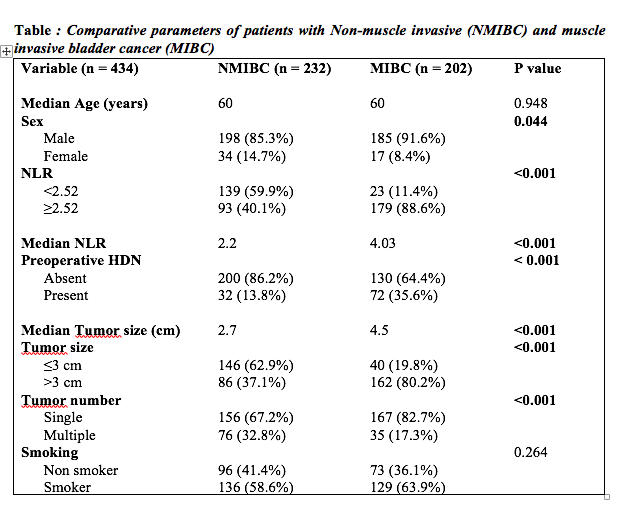 Non muscle invasive bladder cancer (NMIBC) was found in 232 patients whereas 202 had MIBC. The median NLR was significant higher in patients with MIBC as compared to NMIBC (4.03 vs 2.2; p <0.001) and in patients with T1 tumors vs Ta tumors ( 2.78 vs 2.0l; p < 0.001). A significantly higher proportion of patients with MIBC had NLR≥2.52 in contrast to NMIBC patients (n = 179; 88.6% vs n = 93; 40.1%; p<0.001). 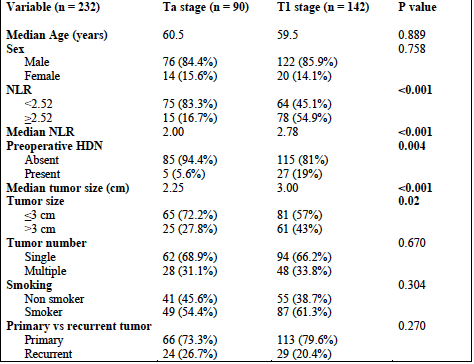 Also, amongst NMIBC patients, a significant number of patients with T1 stage tumors (78/142; 54.9%) had NLR ≥2.52 as compared to Ta tumors (15/90; 83.3%) (p <0.001). High grade non muscle invasive tumors were significantly more common in patients with NLR ≥2.52 (60/78; 76.9%, p <0.001). On multivariate logistic regression analysis, higher NLR, NLR ≥2.52, tumor size > 3 cm and presence of single tumor were significantly associated with present of MIBC on histopathology. No significant difference, however, was found between T2 and ³T3 tumors in terms of NLR. 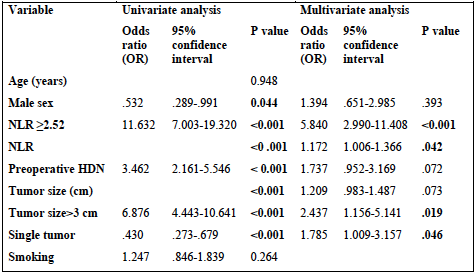 NLR ≥2.52 also predicted the presence of high grade tumors amongst NMIBC patients on multivariate analysis (p <0.001). NLR is a simple, readily available and convenient marker of invasion and burden and helps predict the likelihood of high grade cancers and presence of muscle invasion in patients with Ca UB.